Sign up for the Historical Society’s Complimentary Email Newsletter We hate spam as much as you do; we never divulge your address to anyone. We acknowledge and are grateful for the sacrifices made and creative energies expended by those who came before us. We admire and pay homage to all of those who labored to form this Sarasota home. Conserving our heritage is the Historical Society’s primary concern. Beginning in 1927 with a citizens group’s collection of historical materials and the forming of the Office of County Historian in the early 1950’s, a Sarasota County Historical Society evolved in 1959. The Society reorganized in 1977 as a not-for-profit corporation. Our Museum Booklet is here. 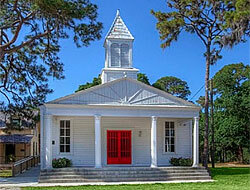 The Mission of the Historical Society of Sarasota County is to foster public awareness of the rich historical heritage of Sarasota County and the state of Florida, encourage inquiry and research into this history, promote collection and preservation of memorabilia, develop a broader appreciation of its historical communities, and protect its historic sites and structures. See what’s happening currently at the Historical Society.